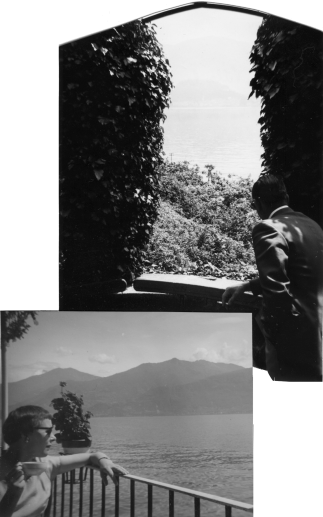 Our 1961 holiday at Tremezzo on Lake Como, Northern Italy. Our holiday started on 27th May, 1961, when Ted and I took the 10.30am train from Swansea (High Street) to London, thence to Chelmsford, where we arrived at 5.30pm. We stayed with Phyllis over the week-end and on the Sunday, Arthur and Gladys came by car with Jill, Mother and Nan (who was spending a week at Kings Lynn). Ken having already come in on his motor-bike, the whole Walker family were together for the first time for very many years. We had our photo taken on the lawn. On Monday at 7.0am, Phyllis, Ted and I set out on our journey, arriving at Victoria Station, London, by 8.30am. From there we got the 9.0am train to Folkestone and then across the Channel to Boulogne, where, after passing through the French Customs, we caught our train to Paris, arriving there at about 6.0pm. 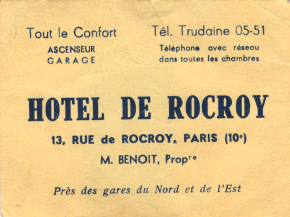 We got to the Hotel Rocroy, near the Gare du Nord, and soon had a wash and a meal, then went out to see Paris by night. Lake in "Bois de Boulogne". 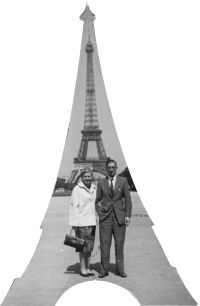 We were very favourably impressed with Paris - we walked along the Grands Boulevards with its fascinating shops, the Avenye de L'Opera to the Louvre and the River Seine, from there past the Arc de Concorde along the Champs-Elysées and right ahead of us everything was flood-lit. The fountains were beautiful and the shining Obelisk with the top of the Arc de Triomphe behind seemed to form a cross of light until we got near enough to find they were two separate monuments. We stopped for coffee at a Café which spilled over on to the pavement. Beyond the Arc de Triomphe with its ever burning flame - tribute to the Unknown Soldier, and the flowers laid there fresh every day - we entered the "Etoile" Metro Station and caught a train to Barbès, from there finding our way back in the dark to our Hotel. Next morning, we were taken by coach on a sight-seeing tour, and saw by daylight many of the places we had seen the night before. We were taken round the Cathedral of Notre Dame, with its beautiful old stained glass windows, some of which dated from the thirteenth century. in Bois de B., Paris. The rest of the day was free, so we made our way to the Gare du Nord Restaurant, where a door opened on its own at our approach. There we ordered bacon and eggs and chips, strawberries and cream and tea - and this had to be done in French as no-one there spoke English. The Head Waiter told us that the "Bois de Boulogne" would be a pleasant place to spend the afternoon, so that's where we went - via the Metro once again. We enjoyed ourselves strolling leisurely in the warm sun, near the lake, through the woods, sat in the flower gardens and sipped tea under the trees at the Restaurant de Crois de Catalon (with the inevitable two tea bags in the teapot). We returned by a different route, past the fair at Carousel and up the Avenue de Grande Armée as far as the Arc de Triomphe, where we sat in the sun for a while before catching the Metro back for an evening meal after which we made our way to the Gare d'este for our night train to Basle. We reached Basle at about 5.30pm and there had breakfast in the Refreshment Rooms, of hot milky coffee, fresh, crisp rolls and plenty of butter and jam. Although Ted made us well aware of the fact that he considered the good old British breakfast of bacon and eggs far superior, Phyllis and I enjoyed the change. Soon we were on our way to Lugano with a panorama of sheer beauty through the compartment window. We passed Lake Lucerne surrounded by snow-capped peaks, and eventually climbed higher and higher till we passed through the vamous "Pfaffensprung" spiral tunnels and so through the St. Gotthard Tunnel, which is 9¼ miles long and the third longest in the world. All this way the weather had been clear and sunny byt when we emerged from the tunnel, the scenery was shrouded by heavy mist which as we progressed became a heavy steady downpour of rain all the way to Lugano. 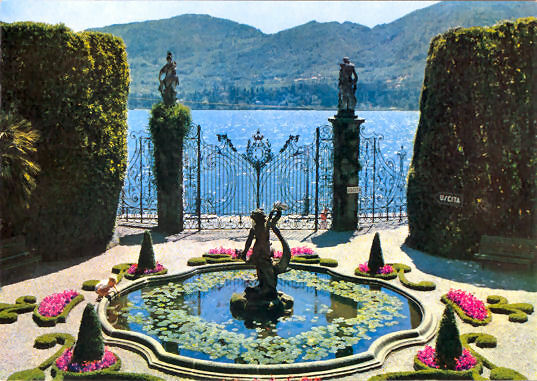 From Lugano Station, a coach took us, via the village of Oria (where we had to stop for Customs examination as at last we were in Italy) along winding lakek side roads to our destination on Lake Como; and the rain still fell. 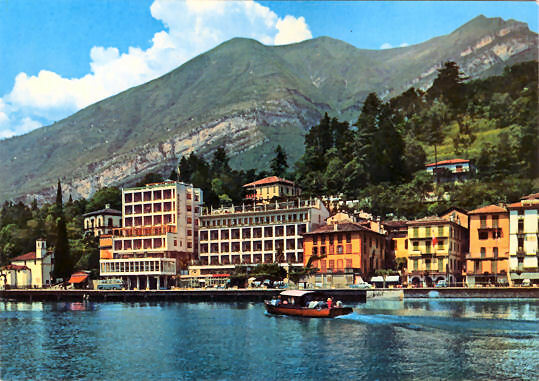 We were very pleased with the Hotel and with the interesting little shops, mostly under cover in Tremezzo, but we wished that the mist would lift from the hills around the lake. The next day the weather was unchanged and we went on a boat to Bellagio in the morning and hunted for presents in the charming little gift shops along the front of the lake. We would have gone further afield but the shops were fortunately under cover, and already our feet were uncomfortably wet. That afternoon we had a "round the lake trip" with a stop at Menaggio. We were glad to catch the boat back again to get under cover from the rain and we arrived at the Hotel rather earlier than planned. Veranda of our room in Bazzoni Hotel. Everyone was happy the next morning to find the mist had disappeared and the sun was shining for our coach trip to St. Moritz. The scenery was wonderful above and below, as we threaded along the narrow steep roads with their breath-taking hair-pin bends, and I was happy to see so many deep blue gentians growing, as I'd never seen them like that before. We stopped for a good lunch at the Maloya-Kulm Hotel. We found St. Moritz very picturesque, but we hadn't brought our camera ! For the rest of the holiday the sun beamed on us, and we enjoyed all the various trips arranged - Lanzo (up in the mountains and overlooking Lake Lugano and Switzerland), Lugano itself, Como, and of course, Milan. Our visit to Como included a ride on the furnicular railway to Brunate, where we had a very good view overlooking the town. 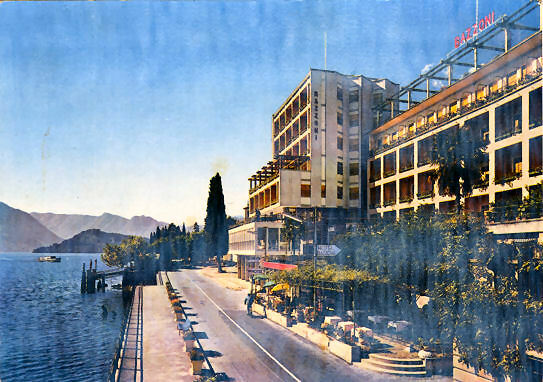 Lake Como from Hotel Bazzoni. At Milan, after visiting a well-known and very unusual Cemetery, we saw the original "Last Supper" by Leonardo da Vinci, and climbed to the top of the Cathedral roof as well as seeing the interior. The descent of the three-hundred dark steps caused Phyllis considerable difficulty and it wasn't till we got to the bottom that she realsed why. She was still wearing her sun glasses! The Scala Opera House was most interesting and we paused for breath (it was a hot day) and iceream at the pavement café just outside. Then we went back through the Arcade to the left side of the Cathedral, where there was a large departmental Store and we had just enough time left for a quick look round it. 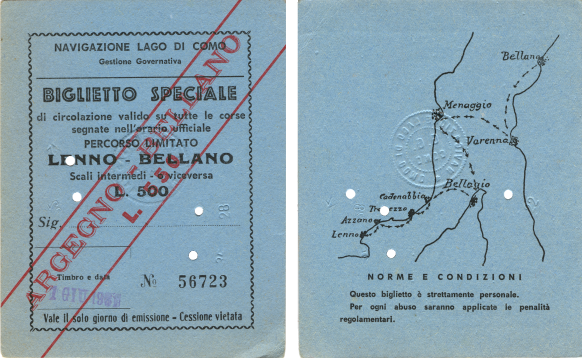 The journey between Milan and Tremezzo showed completely contrasting country, as we had to cross the broad, flat, well cultivated plain of Lombardy with its yellowing fields of wheat, red and blue with poppies and cornflowers, before arriving back in the now familiar Lake District. However, all good things must come to an end, and our last meal in the Bazzoni came all too quickly. 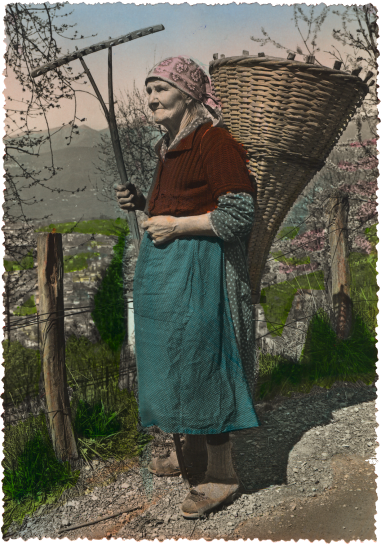 Ronco St. Anna wine will always take us back there in memory; and we are not likely to forget our struggle with the long thin yards of slippery, delicious, spaghetti. We had a good journey back, ahving an hour to spare at Basle, we made the best of it by having a cooked supper there. Our train left Basle at 12.40am, I believe, and so to Calais. The boat sailed for Folkestone at 12.45pm and soon we were back at Chelmsford, suntanned and happy with our memories and one or two carefully selected treasures (including the musical table I had always wanted). After a night's much needed sleep, Ted and I arrived back in Swansea on Friday 9th June, in time for me to get some shopping done near the station, then a taxi home. .......... it was a lovely holiday, but nice to be back. 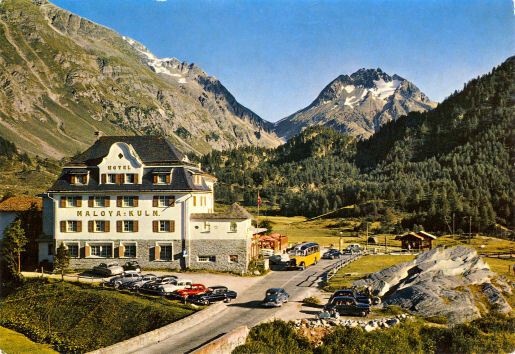 Maloja Kulm, with Monte del Forno. and Piz Lagrev in background. 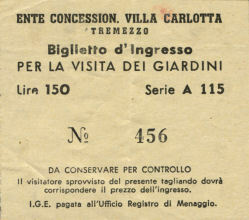 With this ticket we had trip in boat on lake as shown marked by arrows. and his Mistress were shot. "All in the day's work." From Roof of Cathedral, Milan. That photo. on the lawn, Broomfield.